Rian Johnson says "you know exactly as much as you need to know"
I spoke to The Last Jedi director Rian Johnson recently for the home release of Star Wars 8 and although he said he didn't answer the question over who Snoke is for himself before killing him off, he does expect his backstory to explained at some point down the line. "I wrote this movie before The Force Awakens came out, so it’s not like I was reading 12-page Reddit threads about ‘Who is Snoke’ and then defying them all," he tells me. "It never even really entered my mind because Snoke was like the Emperor in the original trilogy, for me, and you know exactly as much as you need to know about him, which isn’t much. It would have felt very out of place to kind of explain that away, and I guess I always assume at some point he’ll be explained in some other materials at some place, but because it didn’t really concern our story I never really went into it." 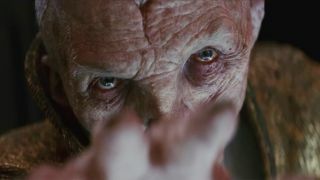 Snoke certainly wouldn't be the first Star Wars character to gain a bigger backstory story or have plot-holes explained through spin-off materials. The only reason we know why C-3P0 has a red arm in The Force Awakens is because of Marvel one-shot comic Star Wars: C-3PO #1 and General Grievous found new life in The Clones Wars TV show. As for when and how we might finally find out Snoke's backstory - we've no idea! Anyone got J.J. Abrams number? It seems not everyone is as desperate to find out though. When I spoke to Luke Skywalker himself, Mark Hamill, he told me he couldn't understand why everyone was so upset about Snoke dying before we found out who he really was. “I was surprised everyone was so upset that they got rid of Snoke.” He tells me. “From Rian’s point of view, it was a big favourite for [Episode] 9 because he’s not important. It clears the deck to have the conflict between Kylo and Rey without him getting in the way and having to explain if he’s a clone or if he’s related to Palpatine... all that stuff”. He's not wrong. With Snoke out of the way, there's plenty more room in Star Wars 9 for everything else. Mark Hamill talks Luke's death (and possible resurrection), the loss of Carrie Fisher, and his favourite Star Wars memories in our interview.